The U.S. Postal Service (USPS) has been deploying IPv6-capable video surveillance system to 40,000 postal sites across the country for over 4 years now using EnableIT PoE Extenders. Several well known trusted security integrators such as ADT and Diebold standardized on PoE Extenders from PoEx to ensure long distance, high-quality video surveillance. The enhanced viability through easy extended PoE IP cameras provides the USPS with superior low cost security surveillance coverage and network management capabilities. These PoE IP video platforms have been integrated into the existing USPS network. Video surveillance is critical for the US Post Office to prevent and investigate burglaries and other security incidents that occur inside and around USPS facilities. The PoE Extended IP-based cameras and systems offer features unavailable in traditional closed circuit television (CCTV) systems. For example, the ability to view live video from remote locations through an Internet connection. The PoE Extended IP-based cameras and systems provide the USPS with better abilities to centralize video surveillance and security operations. Unlike an analog CCTV system, a digital IP-based system provides an easier means to store video footage for later search and retrieval during an incident investigation. The need for security in government buildings is something that most citizens won’t argue with. But while police officers may guard a courthouse, some people may wonder why it is that buildings such as a post office need to have security cameras. The answer is obvious: a post office is a potential target for criminals just as surely as any other government building is. 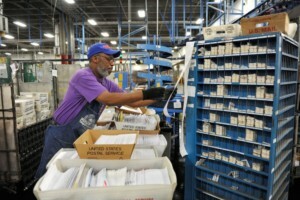 The US Post office also has internal theft and incidents of workplace violence that need to be under surveillance to reduce any occurrences. The rollout and use of PoE Extenders has been and is coordinated by the USPS Office of Inspector General (OIG) and the U.S. Postal Inspection Service. The USPS OIG is an independent entity dedicated to the US Post Office, while the Inspection Service is a division of the USPS responsible to ‘secure the nation’s mail systems’ and investigate incidents involving the postal system, including the physical security of the facilities. 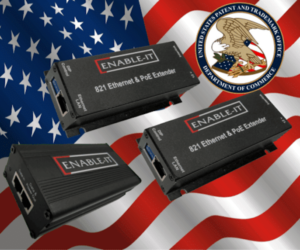 Part of the USPS’ goals for mandating this IP based video solution was the use of Enable-IT PoE Extenders to be able to increase surveillance coverage both inside and outside of US Postal facilities at a low cost. Most post offices have some security cameras inside the building. Those cameras watch transactions, the lobby, and who uses the post office boxes. They are the cameras that people traditionally think of when they think of security cameras. In some locations, the distance for installing PoE IP based cameras was beyond the Ethernet distance limit of 100m or 328ft. Simple single power source PoE Extenders drove the power and Ethernet data signal up to 2,500ft away. Some post offices also have exterior security cameras to monitor the outside of the building, including the side and main entrances and perhaps even parking lots. Many of those cameras swivel to watch larger paths of entry, and they may view other nearby buildings as well. Almost all of these locations required weatherproof PoE Extender solutions in order to provide maximum visibility and coverage.